Gordale Scar is a limestone ravine 1 mile (1.6 km) northeast of Malham, North Yorkshire, England. It contains two waterfalls and has overhanging limestone cliffs over 100 metres high. The gorge could have been formed by water from melting glaciers or a cavern collapse. The stream flowing through the scar is Gordale Beck, which on leaving the gorge flows over Janet's Foss before joining Malham Beck two miles downstream to form the River Aire. A right of way leads up the gorge, but requires climbing approximately 10 feet of tufa at the lower waterfall. William Wordsworth wrote in the sonnet Gordale, "let thy feet repair to Gordale chasm, terrific as the lair where the young lions couch". James Ward created a large and imaginative painting  of it that can be seen in Tate Britain. 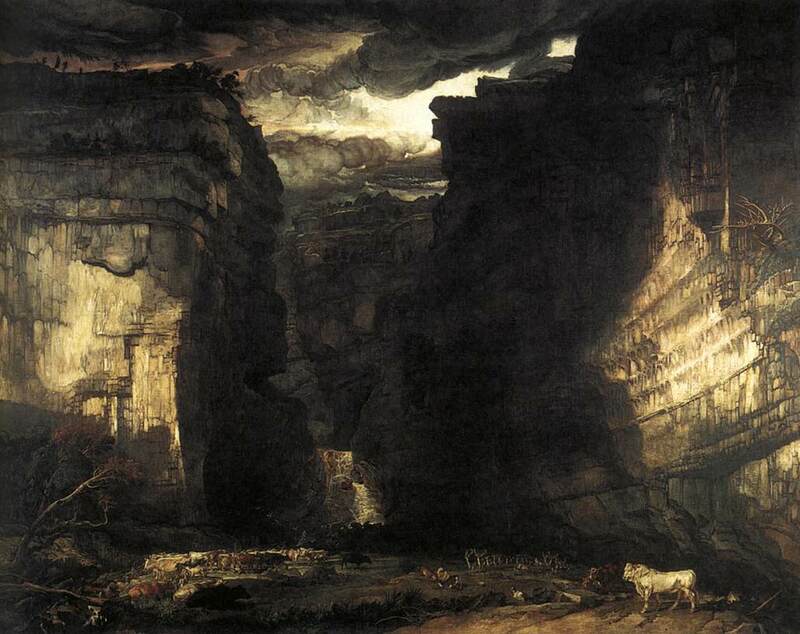 J. M. W. Turner also painted a picture of it in 1816, also to be seen in Tate Britain. The valley just downstream from Gordale Scar. ^ Bagshaw, Mike; Mills, Caroline (2010). Alastair Sawday's Slow North Yorkshire: Moors, Dales & Coast, Including York. Alastair Sawday Publishing Co. Ltd. p. 39. ISBN 978-1-84162-323-8. ^ Fellows, Griffith (2003). The waterfalls of England : a guide to the best 200. Wilmslow: Sigma Leisure. p. 138. ISBN 1-85058-767-1. ^ Wordsworth, William (2008). The Complete Poetical Works of William Wordsworth, in Ten Volumes - Vol. VII: 1816–1822. Cosimo. p. 104. ISBN 978-1-60520-263-1. ^ Turner, Joseph Mallord William. "Gordale Scar". www.tate.org.uk/. Retrieved 11 July 2015. Wikimedia Commons has media related to Gordale Scar. This Craven location article is a stub. You can help Wikipedia by expanding it.